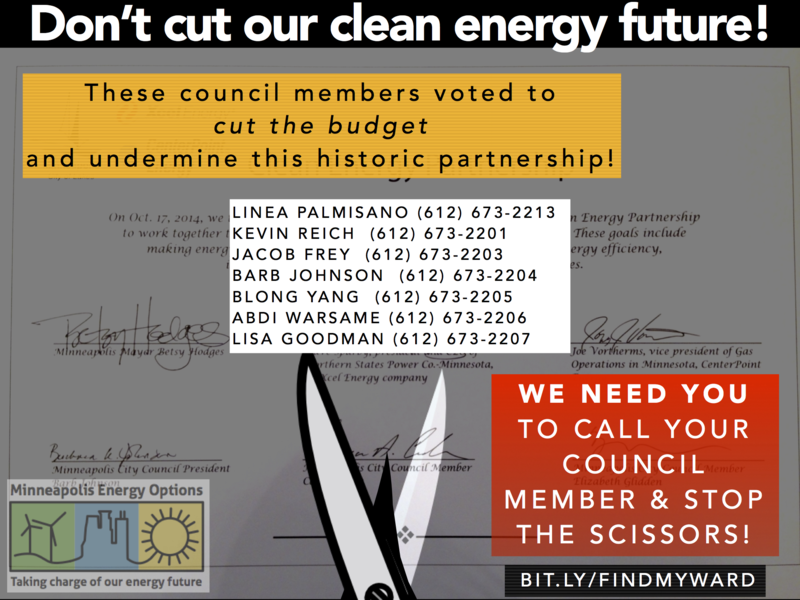 We Need You to Stop the Scissors From Cutting the Clean Energy Partnership! Update: The Minneapolis City Council voted 13-0 on December 10th to restore the full $150,000 for the Clean Energy Partnership into the final 2015 budget. It's unbelievable, but the city council voted 7-6 yesterday to halve the budget for the clean energy partnership. We've come too far to let a little budget fight kill the first-in-the-nation city-utility partnership, but we need your help letting city council know that we can't secure a better energy future on a shoestring budget. Join us at the city council hearing on Dec. 10 at 6:05pm to let city council know we can't cut our energy future (location info below)! But before next Wednesday, city council members need to hear from you (respectfully) about their mistaken vote! It matters the most if you're a constituent, so find your ward and council member! Read on for some suggested talking points, and a graphic you can share to let your neighbors know we need their help! Come and tell city council not to cut the clean energy partnership budget! The Partnership represents $450 million in city-wide energy expenses annually that Minneapolis can use to drive local clean energy economic development, fight energy poverty for low-income families, and pioneer a new energy future. It also pours ~$24 million annually into the city budget. We need to dedicate significant resources to running this Partnership wisely so we can create real energy solutions for the city. Xcel and CenterPoint will be watching the partnership for signs that the city is not really serious about moving forward. Cutting the budget suggests we're not really expecting them to step up and contribute significant resources to getting the job done. The last two years of community leadership that pushed to create this City-Utility Partnership gives you a mandate to make the City Energy Vision a reality. Defunding the staff time to implement this vision makes all these efforts a commitment on paper, not in action. Staff at the city originally recommended a $500,000 budget to begin implementing energy partnership programs that will save Minneapolis residents, businesses, and local government millions annually. This proposal was already cut to $150,000; cutting it further to $75,000 will make partnership programs unworkable. The current proposal cuts capacity for a clean energy partnership while sustaining several programs that are more costly and have less long-term potential to create economic justice in Minneapolis. The Convention Center is still getting a $400,000 increase for marketing. The new proposal for a "Holiday Market" downtown is also still fully funded. These or other costly programs should absorb cuts. Protect the Clean Energy Partnership! Tell your friends and neighbors we need their help, too! Share this graphic on Facebook!